Are you looking for light-weight, beautiful WordPress themes? You will get thousands of free themes on the web, but they will have one or another limitation. They may not give frequent updates or lacks professional touch. Most of such templates come without theme settings, SEO optimization, and dedicated customer support. So what’s the use of installing free themes on your website? The themes and plugins should be updated regularly to prevent hacking attempts and keep your website safe. A fast loading theme is needed to optimize your contents for search engines and improve the traffic. A premium theme is the only way to achieve all these goals. If you are a developer, you need not go to third parties to buy themes. Develop templates with own skills, requirements and sell them through marketplaces to make money. 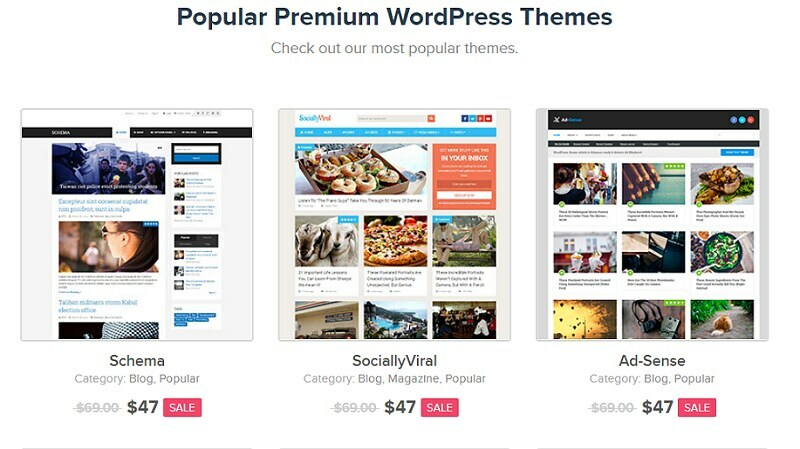 We discussed 7 best places to buy premium themes for your WordPress website. MyThemeShop is one of them and my favorite in the category. MyThemeShop has a good collection of themes for any kind of website. Their number is 120 at this moment which can be used for business websites, blogs, magazines, e-commerce portals etc. I have personal experience with MyThemeShop products and services. Their customer support is fantastic which typically answer your queries within minutes. Just post your support requests via forums and any staff will respond to you shortly. They charge $27-$47 for single products and $87 for membership plans. The extended membership subscribers can use all MyThemeShop themes and plugins for free without any limitations including access to the new products and PSD files.